Sheffield digital agency Evoluted has hired three new members of staff. 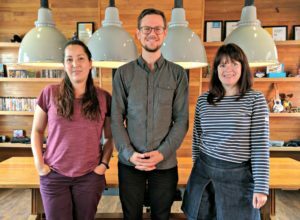 Rebeca Radford and Gabriel Morrison join as project managers, whilst Laura Kishimoto comes on board as lead front end developer. All three acquisitions arrive from other digital agencies in Sheffield: Radford from Quba, Morrison from SEO Works and Kishimoto joins from Inviqa. Earlier this year, Evoluted’s directors also completed the takeover of local agency Reflow Studio, expanding the team by 25%. The agency works with clients including Artistic Flair, Sheffield Music Hub and Twinwoods Adventure.